A damaged hose assembly does not necessarily mean it’s service life is over, Richards Hose offer a number of services which can help to extend the working life of your hose assembly. Whether the damage is to the hose or the couplings, we can re-use or replace with new. If you wish to have your own couplings/hose assembled by one of our experienced technicians, we would be pleased to arrange the collection of your materials and deliver back to your preferred destination. We would offer you the choice of a galvanized steel wire (as standard) or stainless steel wire to complete the assembly. During service, small holes and tears can occur to your hose, often caused by abrasion. However this doesn’t necessarily mean that the hose needs replacing. We can cut back the hose to the damaged area and ‘re-end’ using the original couplings or new, meaning your hose can be put back into service again. In some cases we can offer an option of cutting out the area with defects and re-end producing two hose assemblies. Instead of cutting back the hose thus reducing the length our technicians would remove one coupling and inserting a repair sleeve over the damaged area to create a pressure tight puncture repair. This would be a more temporary option until a replacement hose is issued, although has proven to offer a long service life. If you would like to arrange a repair of your existing hose equipment our expert team are here to help. Call us on 01772 651550 or fill out an enquiry form today. It is inevitable that any hose used in an emergency application will be subjected to robust handling, however, much can be done to prolong its service life. 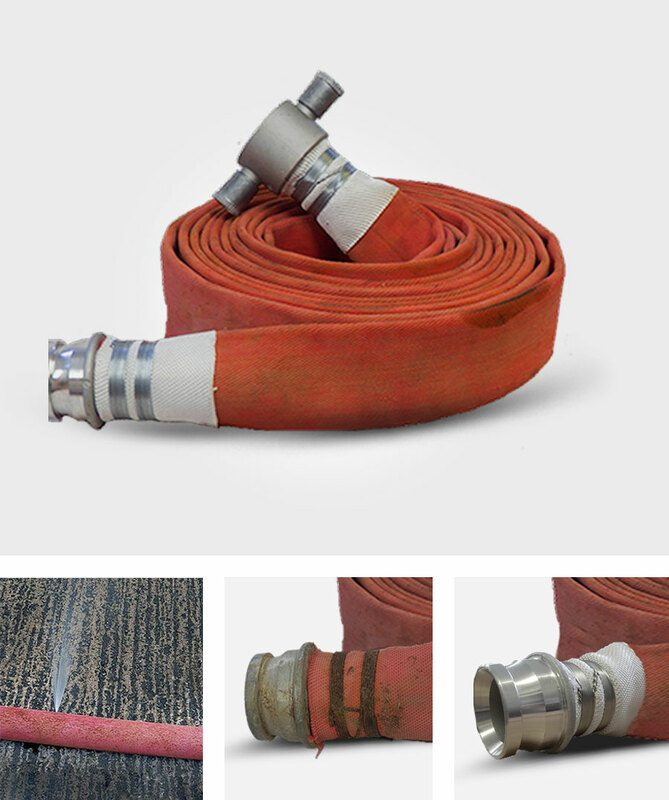 Any fire service will take great care of their hoses as a matter of course but other users may not implement such methods to prevent damage occurring. The following is offered as a simple guide to help you to get the best out of your hose, whatever the application. Do not exceed the maximum rated working pressure. Always lay the hose without any twisting or kinks. Handle the hose with care, treat it with care. Avoid any dragging. If this must be done, do it when it is empty and flat. Do not drop the hose, particularly the coupling ends. Avoid pump vibration with bandages or sacking. Avoid shock loading and ‘Water hammer’. Do not pull hoses over sharp edges. Never lay hoses over hot embers. Never walk along full hose to empty it, always put the hose over your shoulder. Do not roll or kink a frozen hose. Do not drive over a hose, always use Hose ramps. Clean and dry hoses thoroughly after use. Examine couplings for rough edges after use. Avoid contact with hazardous materials such as acids, mineral oils and chemicals.